I thought I'd change things up a bit and show you a video at the start of the post today. It's only a min and a half long, so take a peek and then I'll explain why I'm so enthused about it. Isn't that nice? The song was written by Janet Tronstad and her friend, David White. Janet is the author of the Dropped Stitches and Dry Creek series of books from Harlequin Love Inspired and Love Inspired Historical. I've known Janet since 2006 when I joined the eHarlequin Community and started hanging out on the forums - specifically the writing and Steeple Hill boards. It's a great place to learn and hone the writing craft and make friends at the same time. I don't know how many of the 2,000+ eHarlequin members are published, but it's a huge percentage and they're willing to help the unpublished join them. I received my first rejection - a 3 line form letter - back in 2007. Since I'd submitted that first manuscript to Steeple Hill Love Inspired, it was only natural for me to go looking to the Steeple Hill forum for answers. Okay, I admit... it was a lot of crying, too. But it was the only place I knew where people understood what I was feeling. How could they reject my query and not tell me anything except that it wasn't suitable. Not suitable? I'd read over 200 Love Inspired novels by that time. Of course it was suitable! How naive I was back then. I thought it was the editor's job to tell me why my manuscript was rejected. I said on the forum, "How am I supposed to fix it if I don't know what is wrong?" And that's when Janet stepped forward and offered to help. She said she'd give me a quick 30 min turnaround of the first three chapters of my manuscript. I jumped at the chance and emailed it to her. Within 20 mins she replied with several things she thought I was missing. The biggest one was lack of conflict, followed by goals and motivation. Yup. The big ol' GMC. I'll always be grateful to Janet for steering me in the right direction, as well as the encouragement. She said I had potential and one of these days I'll prove she was right. I still have much to learn however, if that last rejection is anything to go by. And one of the best ways to learn is to read from someone who's mastered the craft. Like Janet Tronstad. I believe at this time Janet has 29 books in print and I've read 24 of them. Four are sitting in my to-be-read (TBR) pile, and one (with Jillian Hart) was just released. 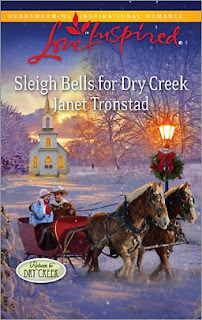 Sleigh Bells for Dry Creek, Love Inspired, Oct 2011 is #22 in Janet's long-running Dry Creek series. The cover is Christmassy, peaceful and inspiring with a western couple enjoying a sleigh ride. (You all know how much I love my sleigh rides.) Yet contrary to the cover, by the end of page one we know the stormy skies are a reflection of Wade's turbulent life. All he wants to do is rest his rodeo-worn body and dream about the girl he left behind 9 years ago whose spearmint gum scent had such an impact on him that he bought a packet of the stuff on his way out of town. The same packet he carries in his shirt pocket as a constant reminder of Amy and the possibility of a better life. Only a few pages later, Wade sees Amy, realizes she's still in town, and knows he has to explain why he stole a kiss and left without saying goodbye. Amy was only 15 yrs old when Wade kissed her on the church steps, said he'd marry her - right before he left town. She waited for him. She turned down dates so she wouldn't betray him. She ignored the gossip and turned away from pitying looks. Until she saw the neighboring newspaper photo of a woman giving Wade a kiss along with his rodeo trophy. He'd been so close but hadn't tried to see her. Hadn't appeared to lack for company, either. That's when she knew his kiss hadn't meant anything to him and she was free to find someone else. But first love roots deep and she'd never met another man who hitched her heart like Wade. That's all in the first chapter of Sleigh Bells for Dry Creek. I've glossed over the facts, but Janet tells it with such heart-wrenching emotion, I'm locked into the book. It's the little details like Wade keeping the packet of gum because it reminds him of her. I care that Wade doesn't know Jesus. And I empathize with Amy because she feels God has forgotten about her. I want everything in their path to be cleared away because they're hurting and the only way to happiness is if they are reconciled together and with God. Yet, the four of us have a long road ahead. And I loved every minute of it. Janet's song has the same emotion but on a different level. The YouTube version is only part of the song as Janet has released it as an MP3 download on Amazon. That means for 99 cents, you can download the complete version to your MP3 for your own convenient listening pleasure. 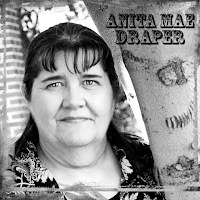 Download "Denim Sky (Montana Quilting Song & Dry Creek tribute)". If the link isn't working, go to www.amazon.com and click on MP3 store in the left dropdown sidebar. Type in "Janet Tronstad" and this comes up, Or click here. Read Janet's blogpost where she explains how she puts her books into song. Visit Janet's website for more info about her and her books. Do you know of any other authors who use music to promote their books? Actually, if my contemporary book with the Muslim character ever finds a home, I would use some of the songs that I've written to help promote it. I actually use one of the songs in the book. Main character is watching the video on Arabic television. And the first of my songs is being shown on tv now. Of course, Dina. I should have thought of you. Oh - and I finally received Dance of the Dandelion! I'm excited to read it, but I have 2 books I need to finish first. I couldn't help flipping through the pages, though and saw what could be a poem or song. Yes, I wanted to stop and see what it was, but I didn't allow myself to do it. Every time I read ahead in a book, I discover something I later wish I hadn't. DeAnna, you'll never know until you try. I was actually thinking the same thing as I wrote the post... that creative people usually can't confine themselves to one medium and find other ways to release their feelings. Songwriting is merely words used in a rhythm. Most writers find a certain cadence in their writing anyway. Dina, I can see how using historically accurate snippets would satisfy certain readers, especially if they recognize the work, but I like to think you could gain a larger following by giving your readers that extra gift of yourself. Back in boot camp when our instructors were trying to get us to stand at attention with our shoulders back and our chest thrust out, they'd yell, "If you got it, flaunt it!" Yes, this was years before anyone even imagined such a thing as being socially incorrect, but that's beside the point. The thing is, if God gave you the gift of song, use it wherever and whenever you can so it may fall upon the ears of those who need to hear it. And now I'll have to hide your book before I'm tempted to read it out of order. Ha! Actually, I'm a singer (spent almost 20 years with a pretty good praise team and traveled with them a bit) and sometimes piano player (very bad now -- no practice). And, yeah, I'd say there's a certain rhythm to my writing. I've just never really tried my hand at songwriting. This was amazing, Anita Mae. Wow. Loved that video and learning about this side of Janet Tronstad. Okay, Inkies. I guess we'll have to see what we can do with our poets and singers, and we know Barb can make an awesome trailer. I'll just sit back and cheer! This was a real treat, thanks! Thanks, Deb. I appreciate you saying it. DeAnna, that's great! You can be the singer for our promotion videos. I tried to use music in one of my historical novels. It was so corny. I am no good at writing poetry. At least not the standard type. I think to write music, you have to be able to write poetry. Dina is very good at it. The poetry in Dandelion is beautiful. Dina, I can't wait to read your 'friends' series. Fun idea! It takes the "book trailer" idea to a new level. Love the Dry Creek series, BTW. Suzie, some of the most memorable songs are the corniest. I like to think it's because simplicity = homemade = warm fuzzy feeling. Hey Niki, another Dry Creeker! It doesn't seem possible that just a couple years ago no one had imagined using a trailer to sell books. People are still surprised when I mention it - until I show them the actual video. I guess it was just a matter of time before someone stepped up the game. Great post, Anita. What a wonderful idea. And the story sounds great, too. I am definitely going to have to add this book to my TBR pile.